L: 58" x W: 18" x H: 80.5"
Bay City 2-pc. China Cabinet w/ Lighting Both refined and practical, the Bay City china cabinet delivers elegance that’s fit for a formal gathering. Beautiful cherry veneers are presented in a reverse diamond pattern on the doors for an eye-catching look, while nickel-finished hardware delivers just the right amount of pizzazz. The china cabinet offers plenty of storage as well, including 4 felt-lined drawers and glass shelving that can be illuminated just by touching the top left hinge on the hutch. Both refined and practical, the Bay City china cabinet delivers elegance that’s fit for a formal gathering. Beautiful cherry veneers are presented in a reverse diamond pattern on the doors for an eye-catching look, while nickel-finished hardware delivers just the right amount of pizzazz. The china cabinet offers plenty of storage as well, including 4 felt-lined drawers and glass shelving that can be illuminated just by touching the top left hinge on the hutch. L: 58" x W: 18" x H: 36"
L: 58" x W: 18" x H: 44.5"
This cabinet set look very nice, we bought the whole Bay City dining set, the poplar wood was just one of the softest wood after the pine wood, so it's easily got scratch or damage and the left glass door of the cabinet need a little hard push to close, and the door knob for the buffet cabinet keep getting loose. It gives the kitchen a brand new look! The older china cabinet lasted 50 years--I hope this one does, too!! I have been looking for a china cabinet for my dining room for awhile. I decided on this one because it matched my table and chairs perfectly. Also because the draw space is so spacious. It has a lot of storage compared to other cabinets I looked at. It really makes the room look more elegant as well! Delivery was great too! They called the day before to confirm and also the day of, about a half hour before, to let me know they were coming. Set up everything seamlessly! Lastly, the price was great! Got it on the Veterans Day Sale! Looks fabulous and quite classy - seems like a high quality piece. Delivery was smooth and efficient. AWESOME DINING ROOM SET!!! I LOVE IT!!! HAS A ELEGANT LOOK, VERY STURDY AND HEAVY!! IT WAS DELIVERED TWO DAYS LATER WITH NO PROBLEM!!! DELIVERS WERE NICE AND VERY HELPFUL. VERY, VERY SATISFIED, THANK YOU! 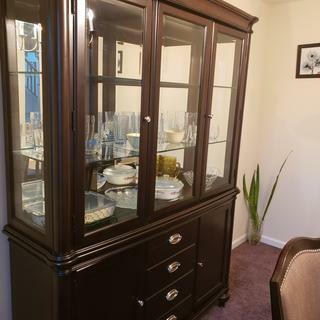 This 2 piece China cabinet and buffet is the centerpiece of our dining room. What a pleasure it is to see every time we walk in to the room and the remarks from friends makes it even better. We love this piece and are so happy we chose it. Delivery was perfect with very nice and careful men. very nice but some minor paint finish issues...waiting for the R&F tech to come out to fix it....we got it to go with the Teagen dining room table and server and they look great together. Very happy. Very sturdy. Looks great. Plenty of storage. Glass shelves are heavy so they can hold heavier pieces. 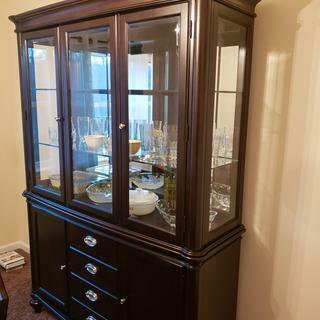 This china hutch is a very good hutch and it is beautiful. The lighting feature is very nice and the quality is exceptional. A china hutch that is well worth the price. It is an outstanding addition to our dining room. This cabinet is Beautiful. It looks great in my dining room. I love the lighting feature! It really makes everything in the cabinet standout. The only issue I have, is that one of the light sockets is malfunctioning and light bulbs are blowing out only days after replacing them. Service Tech is scheduled to come out and replace the light kit. Hopefully, this will do the trick! It is a very good China Closet for the price we paid. It is the right size and looks really nice. The lighting is a nice touch in how it works and the effects the lights have. INSTALLING THE GLASS SHELVES AND SIDE GLASS,IS IT DIFFICULT PROCESS? BEST ANSWER: Most of this will already be put together. Raymour & Flanigan provides a White Glove Delivery service. Delivery includes all necessary assembly and a comprehensive quality inspection of your furniture prior to it being delivered to your home. Some pieces may require final assembly in your home due to their size or configuration. Can you have one custom built to size I need? BEST ANSWER: No, I'm sorry. This is only available in the size shown. Are the door glasses beveled? One lightbulb already burned out after 7 months. What size is it so I can replace? There are no marking on the bulb. BEST ANSWER: For assistance with replacement bulbs, please contact Customer Care at 866-383-4484, option 2. Does this one need assemble? The store delivery personnel will set the china cabinet where you want it placed. They will put the two units together and remove the tape from all the glass. All we had to do was clean all the glass before placing items in the cabinet. No. It came in 2 pieces. BEST ANSWER: Hello Ethel, the Bay City collection is only available in Dark Cherry as shown on the website. How do I move the wooden shelves in the hutch? They are attached in some way. BEST ANSWER: The small metal shelf holders would need to be unscrewed before removal. Do the glass shelves have to be installed with the side with the grooves facing up or down? BEST ANSWER: The grooves on the glass would be displayed facing up. They are intended as a ridge to assist in displaying plates. Is it possible to get an additional piece of just the bottom of the china cabinet as a buffet? BEST ANSWER: Yes, you can just purchase the base of the china cabinet. For assistance with this, please contact us at 866-383-4484 option 3.